The book is publicly accessible again at Steven Halim's webpage at National University of Singapore. The download link has been updated. This book is designed to serve as a textbook for an algorithm course focusing on programming as well as a programming course focusing on algorithms. 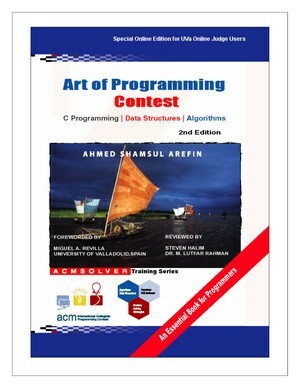 The book is specially designed to train students to participate in competitions, especially the ACM International Collegiate Programming Contest. The book covers several important topics related to the development of programming skills such as, fundamental concepts of contest, game plan for a contest, essential data structures for contest, input/output techniques, brute force method, mathematics, sorting, searching, greedy algorithms, dynamic programming, graphs, computational geometry, Valladolid Online Judge problem category, selected ACM programming problems, common codes/routines for programming, Standard Template Library (STL), PC2 contest administration and team guide. The book also lists some important websites/books for ACM/ICPC Programmers. The Association for Computing Machinery (ACM) sponsors a yearly programming contest, recently with the sponsorship of IBM. The contest is both well-known and highly regarded: in 2005, 2400 teams competed from more than 100 nations competed at the regional levels. Sixty of these went on to the international finals. This contest is known as ACM International Collegiate Programming Contest (ICPC). The regional contest itself is typically held in November, with the finals in March. Teams of three students use C, C++, or Java to solve six to eight problems within five hours. One machine is provided to each team, leaving one or two team members free to work out an approach. Often, deciding which problems to attack first is the most important skill in the contest. The problems test the identification of underlying algorithms as much as programming savvy and speed. :) "I believe that the book will be book will be of immense use for young programmers interested in taking part in programming competitions."